I did something heinous to my back about a week and a half ago, one of those things where you lean forward and when you straighten back up, you want to die, so I spent about a week lying very still and thinking gloomy thoughts about my mortality and the effects of aging on the skeletal system. In the process of all of this mulling, I came to a realization that while I am not a “world-beater” personality, I really hate being unproductive, so while I’m doing much better but not quite 100%, I’m happy to be back on my feet to potter around the house and making occasional short trips down to the river. Today I took advantage of my forced indolence to make one of my favorite winter meals for this weekend – chili con carne. It’s probably a good idea for me to define my terms here before I get into the particulars of how I make this. Chili is one of those things that inflame the passions of purists and sticklers who claim that adding anything besides meat and chiles is heretical. I read a comment online recently where someone said of a vegetarian chili recipe that “you can call it a spicy bean soup, but don’t call it true chili”. But as I am no such food fundamentalist, I unashamedly adulterate “true” chili con carne by adding beans and tomatoes because I like it that way. 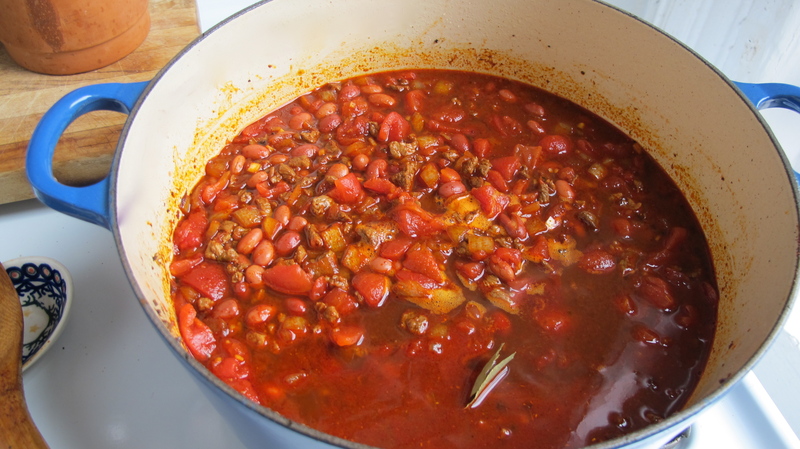 I like a rich, spicy, thick, beefy chili, with creamy beans and a little tomato to brighten and sweeten the sauce. But really, chili con carne is all about the chiles. When we lived in California and I was growing and drying a variety of chiles in our garden, I began to appreciate their nuanced flavors and the ability to combine them into a “custom” chile powder. I love their earthy, spicy, berry fragrance when I open the container where all my chiles are stored. The Mexican supermarkets in Concord had bins filled with ancho, New Mexico, cayenne, California, and guajillo chiles. It is these chiles that are the basis for a lot of Mexican salsas and sauces, like red enchilada sauce, and they are the flavor basis for chili con carne. For my chili powder, I use a mixture of ancho (which is dried poblano), serrano, California or New Mexico chiles, and a chipotle (dried smoked jalapeño) that I grind myself. 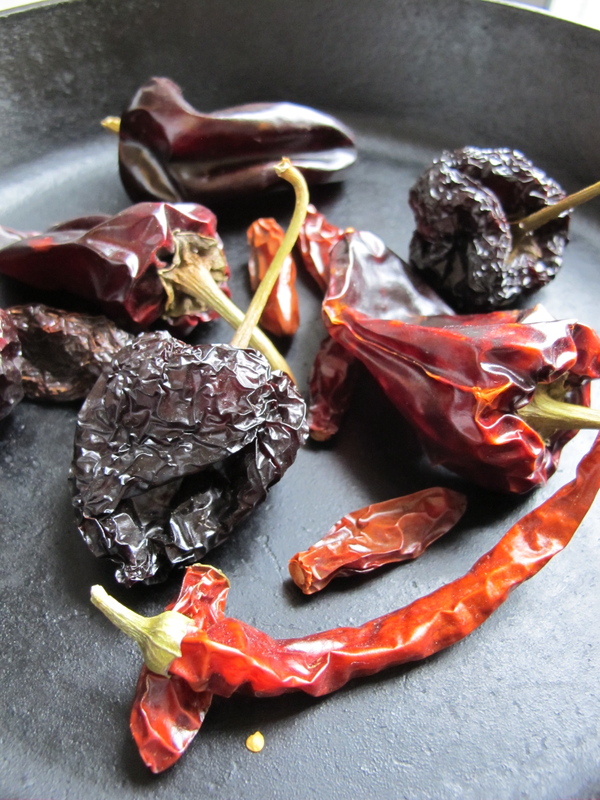 The serranos add some heat, but the other two are just earthy, rich and should have a nice dried berry smell. Chipotle adds a bit of heat and a deep smoky flavor. 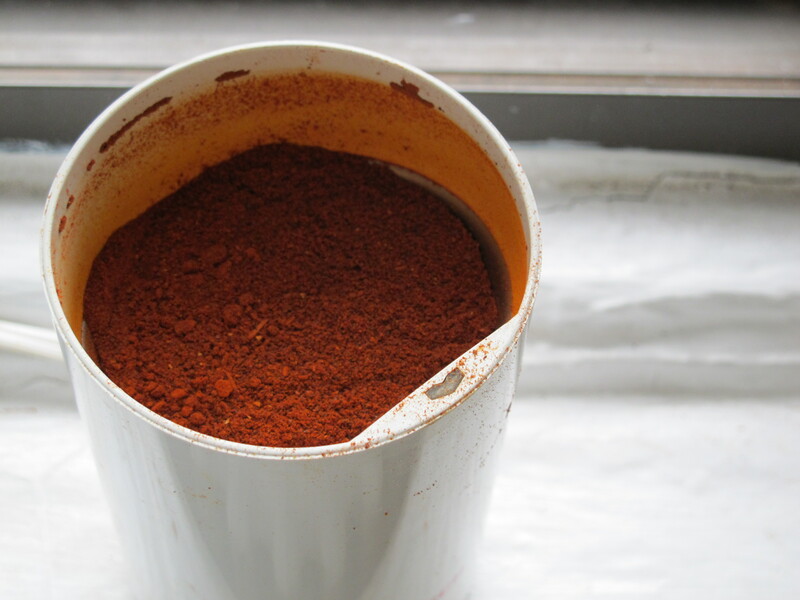 If you don’t want to grind your own powder, I still encourage you to try to blend a couple of different good, freshly ground chiles rather than using the standard chili powder. If you think about chiles as berries, think about the difference between dried cherries and dried blueberries. They each bring something unique to the flavor of the dish, which you can control to your taste when you make your own blend. Penzeys is a good online source and they carry ground ancho and chipotle. 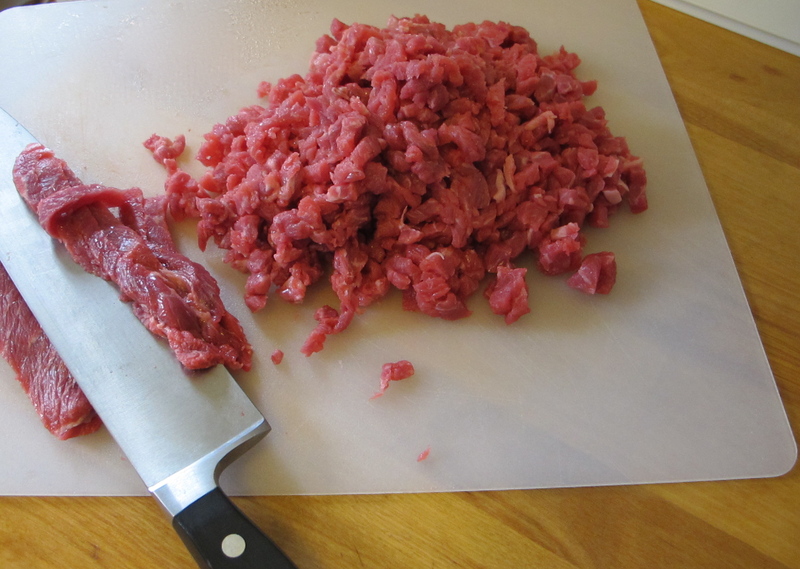 Another of my chili quirks is that I buy a whole chuck roast and mince it myself with my biggest, sharpest knife. It is usually hard to find “chili grind” beef and I prefer the texture of tender little chunks of beef. The regular hamburger grind seems to either disappear into the sauce or else stay a little rubbery. I just like the control that chopping it myself gives me since it also allows me to trim out gristly bits and big chunks of fat. This step is totally optional – you’ll still have a great bowl of chili without hand-chopping the meat, but try it at least once and see what you think. If you use whole dried chiles to make your own chile powder as do I, turn on the oven to about 350°. Put all of your chiles into a cast iron skillet or sheet pan and toast for about 5 minutes until they become very fragrant, then take them out and give them a couple of minutes to cool off enough to handle. Tear the stem ends off the chiles, shake out all of the seeds, and tear them into pieces. 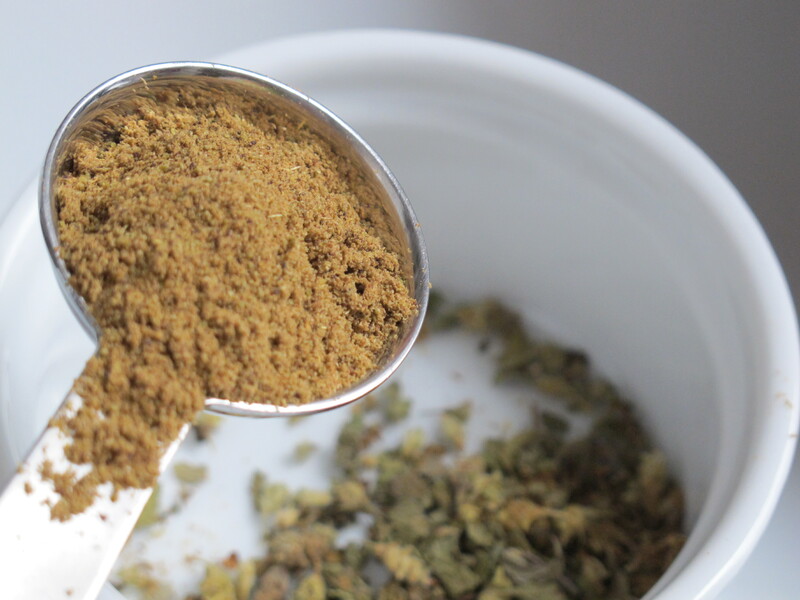 Grind the chiles into a powder in a small coffee grinder. Brown the meat in batches over high heat and then remove from the pot and set aside. Add a little oil to the pot and sauté the onions. Sprinkle on a pinch of salt and use the water that they release to scrape up the sticky brown bits that the meat has left in the bottom of the pot. Once the onion has begun to soften, stir in the minced garlic and cook over medium to low heat. When the onions and garlic have softened, stir the chili powder and other spices and stir until the onions are coated with chile powder. There should be enough oil for it to get moist and toast/fry the chili powder and spices. -3 or 4 cups cooked pink beans or small red beans. 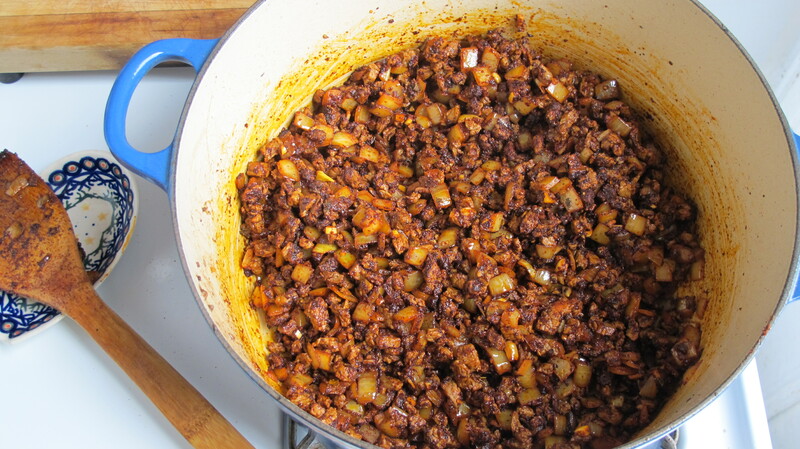 If you cook dried beans for the chili, use the cooking liquid in the chili. If you prefer to use canned beans, drain them and use a little extra water instead. Cover with the pot lid, leaving just a crack, and let it burble quietly over low heat for an hour or so, until the meat is tender. Longer is fine, but keep the heat low and enough liquid in the pot so it doesn’t stick and scorch on the bottom. The acid in the tomatoes will keep the beans from softening much more than they are, so a long simmer shouldn’t hurt them. Taste for salt, maybe add a dash cayenne if you want it spicier. It’s better to make it a day ahead of time, say on a Saturday before a big football game or something like that. I usually serve it with a sprinkle raw chopped onions on top and of course, it’s great with cornbread!